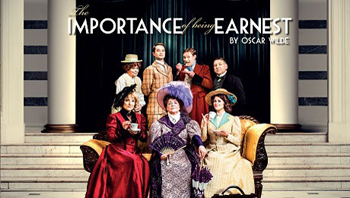 The Importance of Being Ernest is a comedy by Oscar Wilde and takes a satirical look at the lives of two men who lead double lives in order to escape their responsibilities. The men, Jack Worthing and Algernon seek better lives for themselves and the story raises the questions; how important is it to you to be who you are? And would you change yourself to lead a more adventurous or less complicated life? This production, like its protagonists, seemed to have a double life also. The play itself is written with a dry wit which is wonderfully farcical, but the delivery of the lines were at times too quiet, poorly enunciated or merely over-egged, leaving us too often drifting off to think about how cold the theatre was. Granted, the Opera House is one of Manchester’s oldest theatres but management should be well used to winter performances as we were freezing throughout. The 1,920 seater theatre was less than half full and this might have impacted the Arctic temperatures inside, however the use of air conditioning seemed to make matters worse! The design elements of the production were lovely. I found myself being mesmerised by the period costumes and the finery of their attire. Lady Bracknell’s bustle was huge, but her movement was at times inhibited by this. The set design by Gabriella Slade was magnificent to look at, with tall Art Deco flats as the scenic backdrop. This backdrop was not altered for the three locations of the acts but slight changes to the moving set downstage. I personally enjoyed this element of the versatile staging but this design concept also overlooked the setting of the production in early twentieth century, not 1930s. The play featured a high profile cast from Broadway and West End Star Kerry Ellis in the role of Gwendolen Fairfax to television star Gwen Taylor (Coronation Street) as Lady Bracknell. Although they had a lovely rapport on stage, Lady Bracknell’s speech was often at an inaudible volume and I felt sorry for those seated upstairs in the auditorium. That said, it was not a sell-out performance and there were very few seats to project up to. Downton Abbey favourite, Thomas Howes, portrayed a vivacious Algernon, however stage movement often felt too modern for the era of the piece as he draped across the chez long and mimicked meditation. It just didn’t befit a production about the etiquette of the early 20th century. That said, I enjoyed his excitable characterisation and childish fun. Charged with some of the play’s most memorable one-liners, he delivered them with expert timing and a boyish twinkle in his eye. Another energetic performance was delivered by Louise Coulthard in the role of Cecily Cardew. However, what began as a lively embodiment of Mr Jack Worthing’s young ward, soon became tiresome and over the top. Coulthard’s fabulous vocal range and high energy physicality promised light and shade in the performance but we soon found the delivery of every line over-egged and shrill. For the expectation of such a major piece of writing, this was a real let down of what was to be a wonderful night of Wilde at the theatre. The director, Alastair Whatley could have emphasised more the irony of this satirical piece to bring out the subtleties of the performance and allow Wilde’s fabulous writing to shine. The Importance of Being Ernest runs until Saturday 17th March 2018.